Sand Grains from Around the World! Sand isn't a boring material if you know what you are looking at! 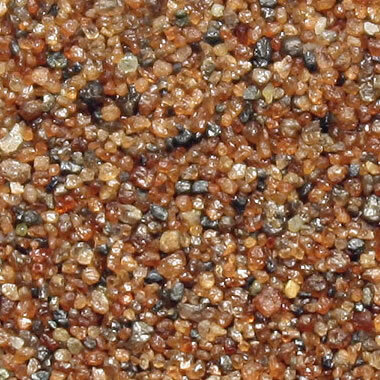 Gobi Desert sand: Highly rounded sand grains from the Gobi Desert of Mongolia. Wind-blown sand sustains repeated tiny impacts as it bounces along Earth's surface. These impacts gradually abrade sharp protrusions from the grains and give their surface a "frosted" luster. The width of this view is approximately 10 millimeters. Photograph by Siim Sepp, used here under a Creative Commons License. 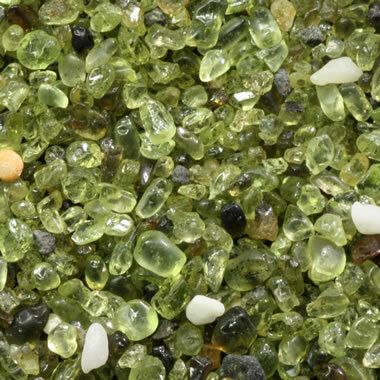 Green olivine sand from Papakolea Beach, Hawaii. 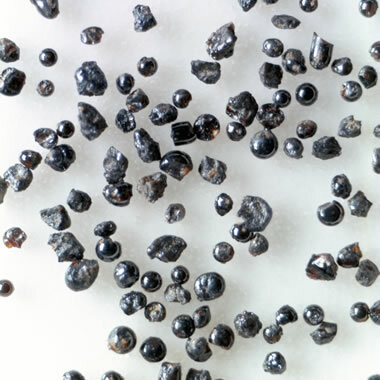 The white grains are coral fragments, and the gray-black grains are pieces of basalt. If you think the grains have a "gemmy" appearance, olivine is the mineral name of a gemstone known as "peridot." This image represents a 10 millimeter x 10 millimeter view. Photograph by Siim Sepp, used here under a Creative Commons License. Sand is a common material found on beaches, deserts, stream banks, and other landscapes worldwide. In the mind of most people, sand is a white or tan, fine-grained, granular material. However, sand is much more diverse - even beyond the pink sand beaches of Bermuda or the black sand beaches of Hawaii. These are just a few of the many types of sand. Some of the beaches of Bermuda have a light pink color caused by fragments of pink coral in the sand. The sand also contains fragments of mollusks, forams and other organisms. This is a good example of an organic sand. This image represents a 20 millimeter x 20 millimeter view. Photograph by Siim Sepp, used here under a Creative Commons License. The word "sand" is actually used for a "particle size" rather than for a "material." Sand is a loose, granular material with particles that range in size between 1/16 millimeter and 2 millimeters in diameter. It can be composed of mineral material such as quartz, orthoclase, or gypsum; organic material such as mollusk shells, coral fragments, or radiolarian tests; or rock fragments such as basalt, pumice, or chert. Where sand accumulates in large quantities, it can be lithified into a sedimentary rock known as sandstone. Most sands form when rock materials are broken down by weathering and transported by a stream to their place of deposition. A few types form when the shell or skeletal materials of organisms are broken up and transported. A few rare sands are formed chemically from materials dissolved or suspended in sea water. This photograph illustrates the size range of sand. 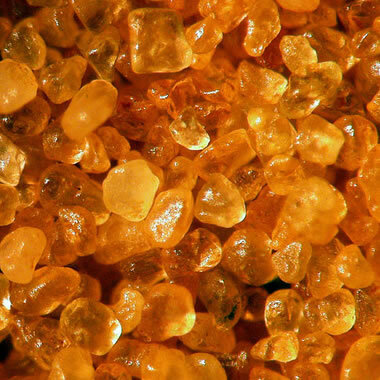 The small tan sand grains in this photo are of a fine-grained sand from Qafsah, Tunisia. 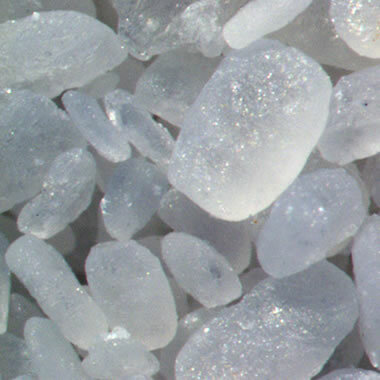 They are about 1/16 millimeter in diameter - the lower limit for a grain to be called "sand size." The large brown grain is from near Worthing, England. 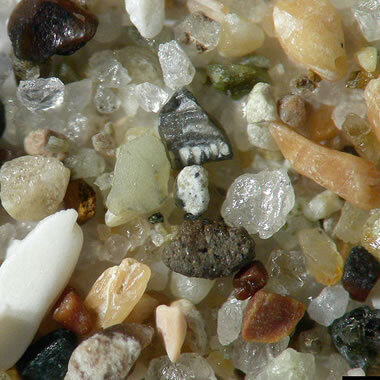 It is a grain of coarse sand about 2 millimeters in diameter - the upper limit for a grain to be called "sand size." Although sand particles are all tiny in size, there is an enormous relative size range between the smallest and largest. Public domain photo by Renee1137. 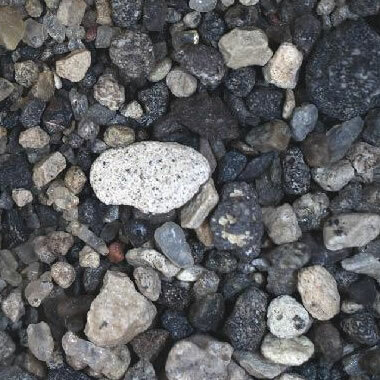 Volcanic rock fragments are the primary ingredient in this sand from Perissa beach on the island of Santorini, Greece, along with some quartz grains and shell fragments. Photograph by Stan Zurek, used here under a Creative Commons License. This page shows photos of a few types of sand that can be found worldwide. Most of the examples here are not typical. They are unusual types of sand that might only be found in a few locations worldwide. These unusual sands are a product of the types of material from which they are derived, the methods used to transport them, the chemical environment of their deposition site, and numerous other factors. After examining these photos you will probably conclude that sand can be a very diverse and interesting material. Thanks to the many photographers who shared their photos through a Creative Commons License. Please see an attribution in the caption of each photo. A person would have to travel the world to get a collection of photos like this. 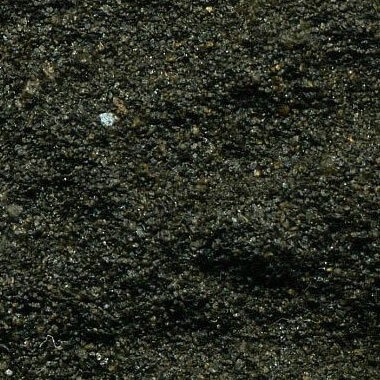 A heavy mineral sand containing abundant garnet from Alma Gulch, Cape Nome, Alaska. Photograph by Siim Sepp, used here under a Creative Commons License. 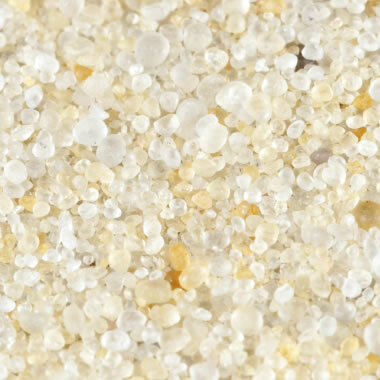 This sand is from Fire Island National Seashore, New York. 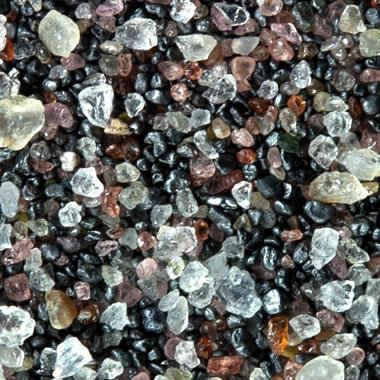 While quartz is the most abundant ingredient of Fire Island sands, abundant garnet, magnetite, and feldspar are often found, along with minor amounts of tourmaline, shell fragments and other mineral grains. Photo by the National Park Service. Frac sand is a commercial product manufactured for the oil and gas industry. It is normally made from weathered sandstone that has a very high quartz content and rounded, competent grains. Most frac sands are produced in the north-central United States where tectonic forces have not damaged the sand grains. Frac sand is a very durable material capable of withstanding very high compressive forces. When oil and gas wells are drilled into tight formations, the production zone is fractured by pumping a high-viscosity liquid down the well. The liquid is pumped at a pressure that exceeds the breaking point of the rock. When the rock fractures, the liquid and billions of suspended sand grains rush into the fractures. When the pumps are turned off, some of the sand grains become trapped within the fractures and prop them open. This allows the flow of oil or gas from the rock unit to go into the fracture and into the well. Grains in this image are about 0.50 millimeter in size. Photo copyright iStockphoto / BanksPhotos. This sand from a dune near Christmas Lake, Oregon likely contains particles of ejecta produced by the eruption of Mount Mazama about 7700 years ago, which formed the caldera known today as Crater Lake. 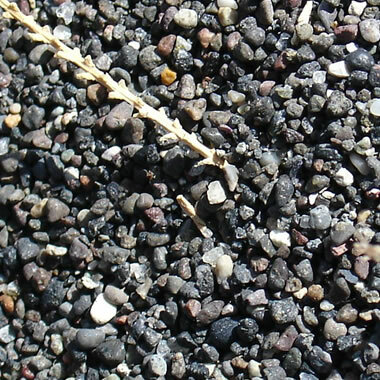 The sand contains grains of pumice (white) and basalt (gray to black). This photo was acquired by NASA while testing the Mars Hand Lens Imager that was used to equip the Mars Curiosity rover. This view represents an area of sand about 14 millimeters across. Some types of sand are highly unusual. This is a photo of selenite gypsum sand from White Sands National Monument, New Mexico. Gypsum is rarely found as a sand because it can be dissolved by water. At White Sands National Monument, a windy, arid climate and a large local supply of gypsum have produced extensive dunes of white gypsum sand. Public domain photo by Mark A. Wilson. 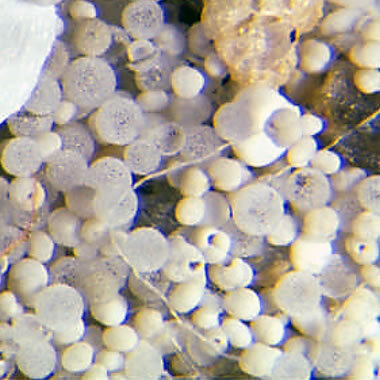 Foraminifera sand from Warraber Island in the Torres Strait (a body of water between Australia and New Guinea). 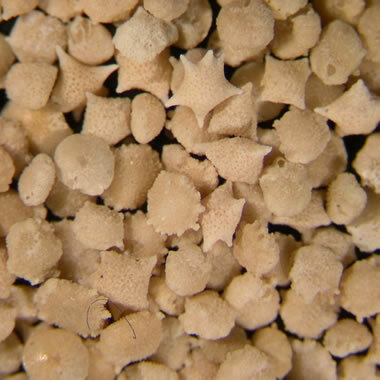 Foraminifera, also known as "forams," are a class of amoeboid protists that produce a calcium carbonate test that can become a sand-size particle after the animal dies. Where they are abundant they can be a major contributor to the sediment. Public domain photo by D. E. Hart. 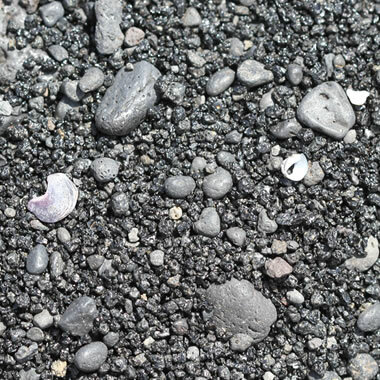 Black basalt sand from Punaluu Beach, Hawaii with some shell debris. Photo by Ryan Lackey used here under a Creative Commons License. 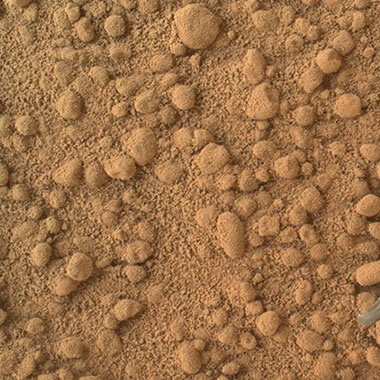 Sand grains on the surface of Mars. The ancient environment of Mars had streams, shorelines, alluvial fans and other sedimentary environments where sand grains were deposited. Today, many areas on Mars are covered with sand dunes and other aeolian features. The planet also has lots of sandstone exposed in the walls of its many impact craters. The largest grain at the top of this image is about 2 millimeters in diameter. Photo by NASA's Mars Curiosity Rover. Photograph of sand grains from the Coral Pink Sand Dunes State Park, Utah. These are quartz grains eroded from outcrops of the nearby Navajo Sandstone with a color that has been caused by iron staining. Public domain photo by Mark A. Wilson. When sediment is being panned or processed for gold, a black sand concentrate of heavy minerals (magnetite, hematite, rutile, ilmenite and others) often remains after the mud and sand grains have been washed off. If you are lucky this concentrate might contain a few grains of gold. 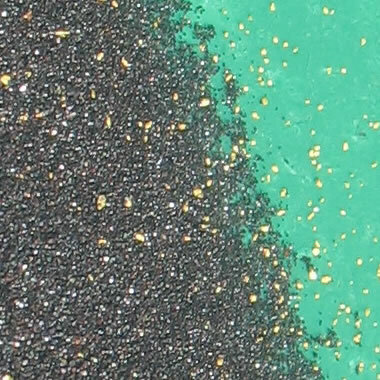 This photo is a view of black concentrate sand with abundant grains of gold with a green gold pan as a background. Public domain photo by Ted Scott. Ooids are small rounded sediment particles that form from the concentric precipitation of calcium carbonate around a nucleus. The nucleus can be a sand grain, a shell fragment, a piece of coral or other material. 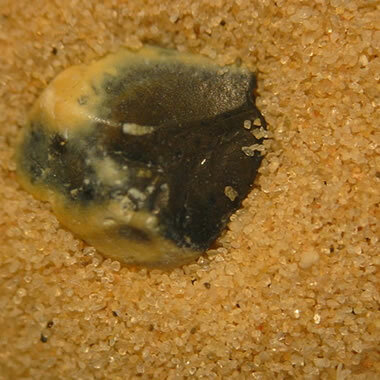 Ooids are usually sand size (0.1 to 2.0 millimeters in diameter). When they accumulate in large numbers and are lithified into a rock, the rock is known as oolitic limestone or simply "oolite." In rare locations ooids can be composed of iron oxide or phosphate materials. Public domain photo by Mark A. Wilson. This is the coarse fraction of a marine sediment sample collected from the Weddell Sea. The round objects are radiolarian tests, from amoeboid protozoa about 0.1 to 0.2 millimeters in size that produce a silica test. They can be used for geological dating, stratigraphic correlations, and assessments of ancient climate. Photo by Hannes Grobe used here under a Creative Commons License. Coral sand is found on beaches in tropical environments where offshore coral reefs provide an abundant source of sand-size skeletal material. The local supply of terrestrial-derived clastic material must also be small enough that it does not dominate the abundance of coral. 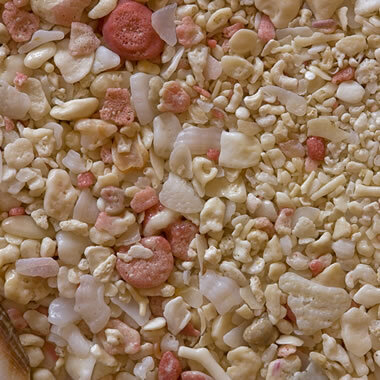 Although the name "coral sand" might be used locally, some of these sands have shell fragments and other materials in greater abundance than coral. Public domain photo by Mark A. Wilson. 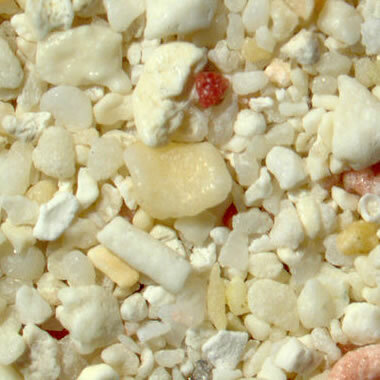 A photograph of a sand sample collected from Pismo Beach, California. It contains a diversity of grain types which include: quartz, chert, volcanic rock, feldspar, and shell fragments. This view is of an area about 3 millimeters across. Public domain photo by Mark A. Wilson. "Tar Sands" are sediments or sedimentary rocks composed of sand, clay minerals, water and bitumen. The bitumen is a very heavy oil or tar with a low melting temperature. Bitumen typically makes up about 5% to 15% of the deposit. When present in large enough amounts, it can be extracted from the rock and be refined into petroleum products. Photo by James St. John used here under a Creative Commons License. Photograph of sand-size glassy spherules collected from the moon and brought back to Earth by Apollo 17 astronauts. Similar spherules have been found at many locations on the moon. Their origin is uncertain; however, researchers believe that it may be related to meteorite impacts or volcanic activity. 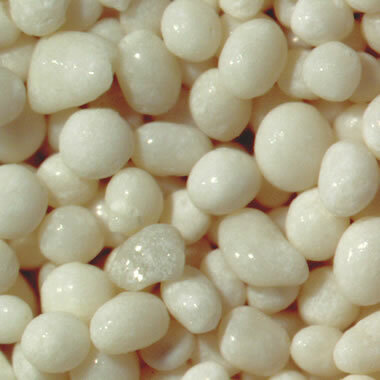 These grains range in diameter from 0.15 to 0.25 millimeters. Public domain photo by NASA.